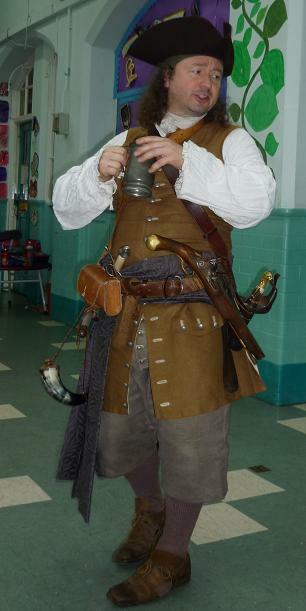 My Captain Burwash character has now worked with children from the age of 4 to 11, sometimes with whole schools or key stages, often with only one or two classes. 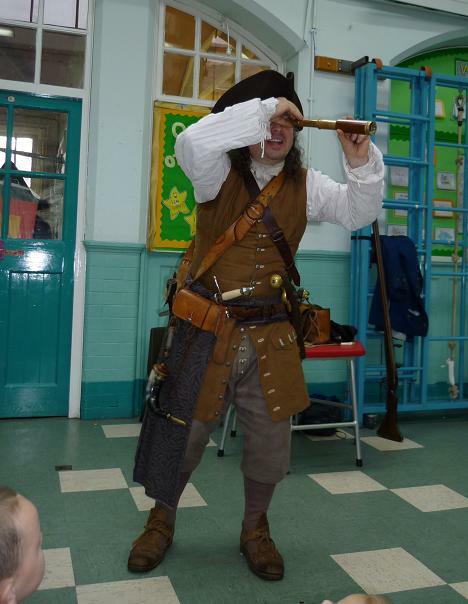 Children of all ages really do love learning about pirates! Here you can see Burwash as he recently visited the nursery and reception children in a Manchester school. Some of the little ones were so tiny that he had to resort to employing his ‘perspective glass’ to spot them! The captain would be the first to admit that talking all day is thirsty work. The only trouble, however, is that the teachers he works with all seem to be a sober crowd, and so it is that although optimistically he carries a pewter pot with him wheresoever he goes, he only ever seems to fill it with water. This picture shows the moment he suddenly thought he could smell rum behind him. He has such an imagination! Luckily so do the children. please could you send a contact address for us to send you the childrens thank you letters? Hello Alison, I have sent my address to Aaamir, as I have his e-mail address.